Coventry has a history that mixes legendary figures (Lady Godiva) with discoveries and tragedy (devastated by bombs during the second world war). It is the 10th largest city in England with interesting locations and people and loads of stories to tell. The workshop will be hosted at The Herbert Gallery www.theherbert.org where we will start and end each day and we will put up a developing exhibition of our the work created during each day in their gallery space. The gallery has a main theme exhibition running at the time called "Recording Britain". Architecture and space. How do we represent space? Drawing is a matter of beliefs, do you believe in perspective? It will be fun but hard work, as you will be experimenting with perspective and spatial representation all the time, learning about different ways of drawing what you see from different viewpoints, some more traditional than others. There are multiple viewpoints in urban sketching. There will be multiple opportunities to try out various sketching techniques without fear, and we will share the work we do and discuss our findings intensely. Each of the instructors will explore different ways of representing space in urban sketching. Representing space “correctly” is quite a daunting task but when we let go and look at the world from our own viewpoint, that constantly moves, views can open up, rules can be bent and we can draw something that is spatially more in tune with how we see. Isabel’s theme is multiple viewpoints: how many ways are there of drawing the same view? how far can we look around and include what we see in our drawings? We will use a mixture of quick sketches to represent your view in different ways, synthesizing its components. We will explore what happens when we bend perspective, move around whilst continuing drawing or reverse perspective. What focuses your attention will be different from one another so one would expect your drawings to be different from each others as you develop your own style. Techniques used will include pen, colour line and colour washes, the order you use them on also changes how you focus your sketch. Be prepared to experiment and don’t worry if you have not worked with perspective before or you have been daunted by it - this is where you can play with it and lose your fears. Space has been one of the main topics in history of representation in arts. Human being has always tried to represent reality. Along the art history we can find multiple ways of this “space oddities”. What I want to try is to make attendees aware that probably most of them are as effective as the common and accepted conic perspective. These are paths already opened but I have not revisited, and I want to go through them again, recovering memories that we have buried deep in our mind. As I have written before space is a huge worry and most of the twentieth art movements answered already with plenty of solutions. We are going to experiment with the idea of how our sight works. Keeping this idea of space recreation in mind we will start to experience it. This workshop will consider a more conventional approach to perspective and architectural drawing. We’ll start by looking at perspective theory and then do some quick drawing exercises which will inform us as we venture out onto the streets of Coventry to draw. We will use our understanding of perspective to help underpin our choice of views to sketch. We won’t be afraid of complicated architectural views, in fact we will relish them. Creative energy is so important, as is enthusiasm for our subject material. Colour or no colour, it’s your choice but an individual approach to the subject matter will be encouraged. We WILL find the drama and we will communicate it expressively, and with increased confidence as we work through this session. Pushing participants out of their comfort zone, at their own level. From beginners starting to sketch to more confident participants, we aim to teach you something new and push you outside your boundaries, helping you to experiment. Experiment with different perspective techniques within a live sketch situation, helping you find your own self expression. Making you confident to represent the surrounding space, however complex. Using and trying different approaches - line drawing with pens and pencils, colour in different media. Making you think about how do you represent what you see and to develop your own way of representing it in colour (and line) with confidence. Losing the fear to draw space and people and stories within it. Welcome in the Herbert Gallery in the afternoon at 4pm. A list will be provided for participants - generally bring what you normally draw with. We hope to engage some good materials sponsors and will update this section to let you know. Cancellation Policy: All fees are fully refundable if cancelled prior to 16 March 2015. If cancelled after 16 March, a £25 cancellation fee will be retained. In the event of too fee registrants, all monies will be refunded. Isabel is Spanish but studied in UK where she practices as an architect and artist. Her passion is watercolour, easy to carry around and sketch on the go and likes experimenting and mixing media to get interesting effects. Isabel started sketching in 1993 as part of her architecture training and continues to this day. 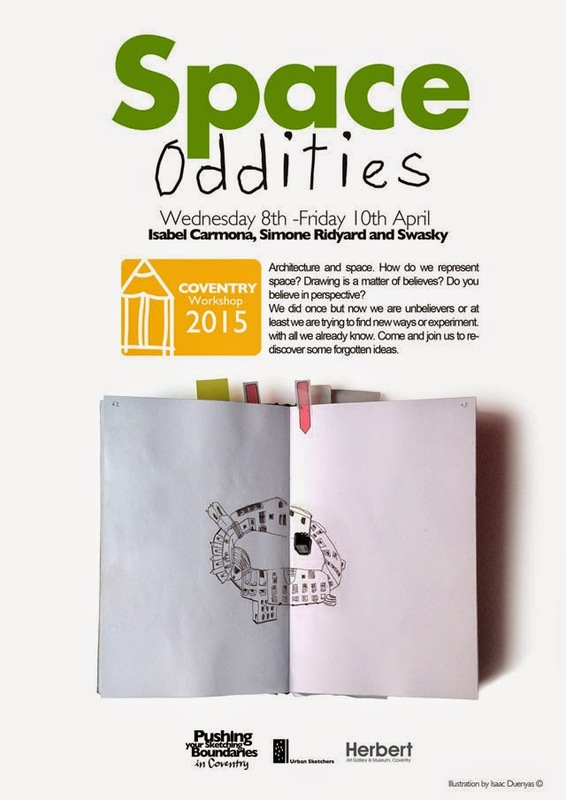 She joined Urban Sketchers Spain in 2011 and USk London in 2014. As an artist she is part of West Berkshire and North Hampshire Open Studios scheme and joined the Oxford Printmakers Cooperative in 2013. Swasky was born and raised in Barcelona, Swasky has been drawing most of his lifetime, but when he finished his BFA he left drawing because he tried to start working. Then he decided to start again a degree in Audiovisual Communication. Once he fulfilled his second degree he worked in an advertising production company, RCR, disappointed with a job so stressful and invidious he left his job and run a shop. With a new life he started drawing again. Simone studied architecture at Canterbury School of Art where the value of pencil, pen and watercolour in the communication of space and buildings became embedded in her work. She now lectures full time at Manchester School of Art. Whilst teaching in Singapore in 2012 she discovered the global Urban Sketching community and set up a USk group back in Manchester. Since then her energetic and prolific work changes, develops and modulates as she takes on the many ideas, comments and experiments that are the stuff of the Urban Sketchers network.